Majors Home Improvement can install a pergola at your home in Pace, Florida. Manufactured by leading outdoor living manufacturer TEMO, our pergolas are constructed of extruded aluminum, a material that offers superior strength and durability. 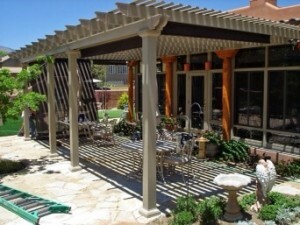 Thanks to this premium material, your pergola will not warp, crack, peel, or become infested with insects. They also feature lattice roofs, beautiful Italian-inspired columns, and low-maintenance finishes. Best of all, a pergola can be installed wherever you’d like around your property, such as over a hot tub, a garden, or patio furniture. With Majors Home Improvement on your side, we’ll help you turn your outdoor living dreams into a reality. Professional installations – Our installers are factory trained and highly skilled, and will install your new outdoor living structure with precision. Additionally, they will be respectful of you and your home, leaving a clean jobsite when complete. Helpful guarantees – Our pergolas come backed by warranties to protect our customers’ investments. Outstanding service – Our commitment to providing total customer satisfaction has earned us an A+ rating with the Better Business Bureau. You can count on friendly service and excellent communication from our team. At Majors Home Improvement, providing superior home improvement upgrades has been our mission since 1997. Allow us to do the same for you. Contact us today to schedule a design consultation for your pergola at your home in Pace, FL.